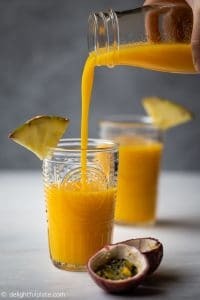 This Tropical Pineapple Mango Smoothie is a tasty and healthy drink with a pleasant sweet fruity scent. It is also dairy-free with no added sugar. 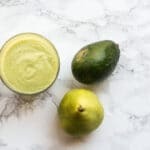 This tropical smoothie uses four delicious tropical fruits to deliver plenty of freshness as well as sweetness, a touch of tartness and a relaxing sweet aroma. If you are in the middle of a cold winter, I hope this smoothie will bring back some sunshine from your tropical getaways. 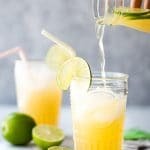 If you are dealing with summer heat, this is also a fantastic drink to relieve your thirst. The fruits I use are mango, pineapple, passion fruits and coconut which are all popular in Vietnam. It is best to make smoothie with fresh fruits, but I sometimes use frozen mango and pineapple and it works too. For coconut, you should use the fresh coconut water from a young coconut for best results. You may want to buy a coconut opening tool to drill a hole on the coconut to get the juice. For passion fruits, choose ones that are purple/red and heavier than their size with wrinkles which indicate they are ripe. 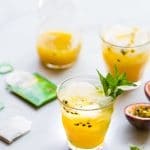 I love to use passion fruits to make drinks, such as this passion fruit smoothie or passion fruit iced tea. It is very quick and easy to make this tropical smoothie. 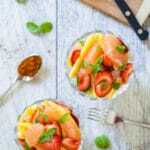 You will need to peel and cut the mango and pineapple into chunks, extract coconut water and passion fruit juice. Then throw all the ingredients together with some ice into your blender and blend until smooth. You don’t really need a very powerful blender to make a perfectly smooth drink with these fruits. However after making smoothie almost every day with my Vitamix in the last three years, I think investing in a powerful blender like a Vitamix or Blendtec is totally worth it. When I was in Europe last month, I tried a Magimix blender which is much cheaper than Vitamix or Blendtec. It seems to to be durable and blend pretty well. If you have other blenders you recommend, feel free to comment and let me know. Cut open passion fruits, scoop out the pulps and strain to remove the seeds. Use the back of a spoon to help extract the passion fruit juice. 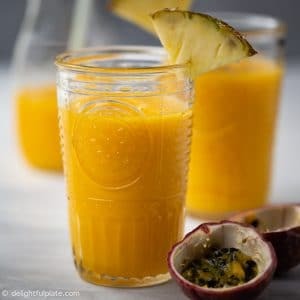 We need about 3 tablespoons of passion fruit juice. 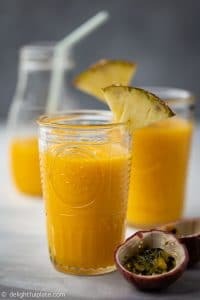 Add mango chunks, pineapple chunks, ice, passion fruit juice and coconut water to the blender container. Blend until smooth. You can control how thick or thin the smoothie is by adjusting the amount of coconut water and ice. Pour the smoothie into serving glasses and serve immediately. It is best to make smoothie with fresh fruits, but I sometimes use frozen mango and pineapple and it works too. For coconut, you should use the fresh coconut water from a young coconut for best results. You may want to buy a coconut opening tool to drill a hole on the coconut to get the juice more easily.